The history of the paper clip: It was invented in 1899. It hasn’t been improved upon since. The paper clip is something of a fetish object in design circles. Its spare, machined aesthetic and its inexpensive ubiquity landed it a spot in MoMA’s 2004 show Humble Masterpieces. This was a pedestal too high for design critic Michael Bierut, who responded with an essay called “To Hell with the Simple Paper Clip.” He argued that designers praise supposedly unauthored objects like the paper clip because they’re loath to choose between giving publicity to a competitor and egotistically touting their own designs. Bierut might be right about his colleagues’ motives, but he’s wrong about the paper clip: It’s not all that simple. Most everyday objects—like the key, or the book, or the phone—evolve over time in incremental ways, and the 20th century in particular revolutionized, streamlined, or technologized the vast majority of the things you hold in your hand over the course of an average day. But if you could step into an office in 1895—walking past horse-drawn buses and rows of wooden telephone switchboard cabinets—you might find a perfectly recognizable, shiny silver paper clip sitting on a desk. What was then a brand-new technology is now, well over a century later, likely to be in the same place, ready to perform the same tasks. Why did the paper clip find its form so quickly, and why has it stuck with us for so long? Before the paper clip, there was paper. When it was developed in China in the first century A.D., paper was made from cotton and linen. (Some contemporary paper is still made this way; most currency is printed on it.) This rag paper was expensive to produce, so it was primarily reserved for permanent writing and sewn into bound volumes. Temporary writing—tracking Sumerian accounts payable or inviting a friend to a birthday party in Pompeii—was done in clay or wax tablets that could be wiped clean and reused. Here in Mr. Snagsby’s inventory we find the most direct precursor to the paper clip: the straight pin. As Henry Petroski notes in his book The Evolution of Useful Things, the pin-making industry was illustrative of the industrialization taking place prior to mechanization. The first chapter of Adam Smith’s The Wealth of Nations features a passage describing the manner in which the manufacture of iron pins took advantage of the division of labor, with one man drawing the iron wire, another straightening it, a third cutting it, and so on. Smith noted that 10 individuals engaged in 10 different parts of the process could together make about 48,000 pins a day, whereas a single individual working by himself could not make even 20. By the end of the 19th century, this process was so efficient that a half-pound box of pins could be bought for 40 cents. But while iron pins were cheap, easy to use, and disposable, they had the obvious downsides of rusting and piercing, leaving stains and holes in the papers they pressed together. 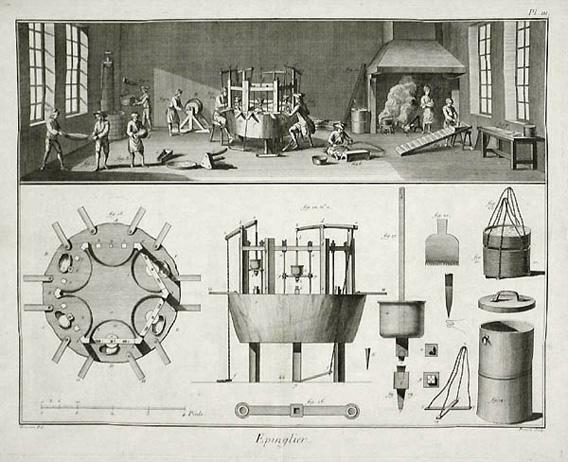 Plate II of Pin Making in The Encyclopedie, 1762. What enabled the shift from the pin to the clip was the development, in 1855, of low-cost, industrially produced steel, which has the right balance of strength and flexibility to make tracks, pipes, wire, and nearly every other piece of 20th-century metal infrastructure. Manufacturers could use the new supple steel wire to draw in space, making strong, rust-free hooks, safety pins, clothes hangers, and paper clips. And in the last quarter of the 19th century, patents were issued for nearly every shape of steel wire that could be imagined to be useful. 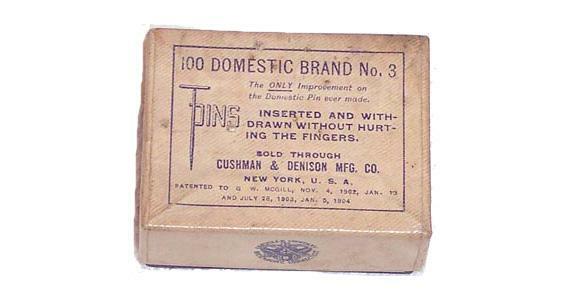 Cushman & Denison T Pins patented in 1902. Image of box via Officemuseum.com. The paper clip we think of most readily is an elegant loop within a loop of springy steel wire. 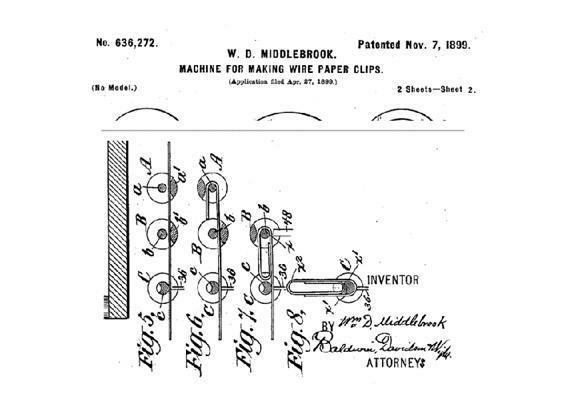 In 1899, a patent was issued to William Middlebrook for the design, not of the clip, but of the machinery that made it. He sold the patent to the American office-supply manufacturer Cushman & Denison, who trademarked it as the Gem clip, in 1904. Middlebrook’s rather beautiful patent drawing shows the clip not as an invention but as the outcome of an invention: the best solution to an old problem, using a new material and new manufacturing processes. Coiled in this form, the steel wire was pliant enough to open, allowing papers to nestle between its loops, but springy enough to press those papers back together. When the loops part too far from each other and the steel reaches its elastic limit, the clip breaks. This property, however, also belonged to the many other clip shapes developed around the same time. 1899 US patent for paper clip machine/USPTO. The Early Office Museum has collected a remarkable array of these. There was the simple and angular Fay clip which, at 1867, is probably the earliest patented paper clip. The slightly intestinal-looking Wright clip, patented in 1877. The Niagara clip—looking charmingly like two clips holding hands—patented in 1897. The more marketably named Common-Sense and Hold-Fast clips of the early 1900s. Some of these, like the bow-shaped Ideal paper clip and the two-eyed Owl clip, can still be found in supply cabinets today. Some of these clips were better for securing larger stacks of paper; some used less wire and were therefore cheaper; some are less likely to get tangled in the box. But the key to the success of the Gem clip can be found in the fact that it was patented first as a mechanism: the shape, which took only three gentle bends and a snip to produce, was easy to automate cheap to produce , and the resulting form, which tidily tucks the sharp ends of the wire away, was lightweight, easy to use, and unlikely to tear the paper it secured. From left; the Fay clip, the Wright clip, the Niagara clip, the Common-Sense and Hold-Fast clips. Once the paper clip was in, the straight pin was out, abandoned to seamstresses and hat-makers. At the same time, its office habitat was in flux. In Forty’s book, he points out that the typical clerk’s desk of the 19th century was backed with rows of cubbyholes: “A clerk seated at a high-backed desk could see his work in from of him and a little to either side, but he could not see beyond his desk, nor could anyone else see what he was doing without coming to look over his shoulder. Such a desk,” Forty notes, “assumed that the clerk was responsible for its contents, and for his work; it represented a small private domain, perhaps with a roll top that could be closed down at any time to secure its privacy.” With the advent of scientific management, which applied the same division of labor found in pin manufacturing to the tasks of clerical workers, permanent filing was moved to a separate department. Paper clips could handle the rest. With cubbyholes no longer necessary, the flat-top desk, with more access to light and air but less privacy, became the standard. 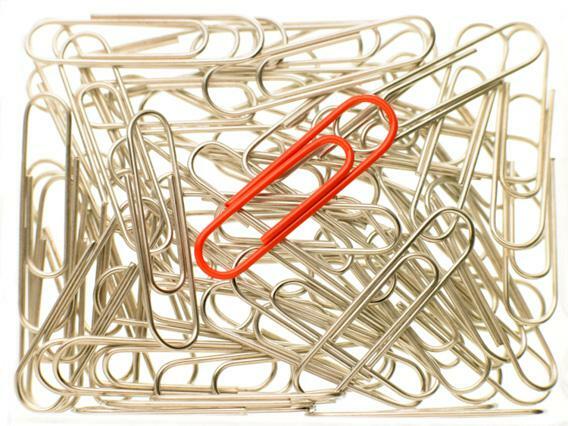 In the years since, the Gem clip has faced competitors offering notches, points, and eyes, but it is still the best-selling form of paper clip. Many of these other paper clips improve on aspects of the Gem clip, but they also raise new problems. Ridged clips, first patented in 1921, grip paper more strongly, but also are more inclined to tear it. Clips with a bent-up lip are easier to slip on, but they make stacks bulky. Other competitors address problems that—frankly—aren’t that problematic. A “time-saving” clip patented in 1992 has two loops on either end, but the time lost by office workers locating the correct end of the clip doesn’t seem to be keeping anyone up nights. And the Gothic clip, patented in 1933, has a pointed inner loop and longer “legs” than the Gem clip, making it less likely to bend and tear paper. It is used by some libraries and archives, and it is in many ways a genuine improvement on the Gem shape, but for most of us, the occasional rip or indent in that top sheet of that stack of invoices just isn’t that important. Sometimes, the best design is the one that is—like the Gem—just good enough. An ad for Gem paper clips appearing in Office Appliances, Volume 36, 1922. Minimal, relentlessly plain, and instantly familiar to a contemporary eye even in an advertisement from 1894, its persistence has made the paper clip the epitome of the disposable, anonymous, manufactured object. It is made for secretaries, for assistants, for subordinates and gofers. It only became most useful once there were millions of pieces of paper that had to be grouped, but that also had to be taken apart again. The staple may contain more potential for physical harm, but the threat of the paper clip is Sisyphean: once you’ve clipped the papers together, you’re probably going to have to unclip them, and then clip together some others, and then unclip those and keep going until you retire, or you get that break in your acting career. Perhaps if Microsoft had chosen an object less reminiscent of mindless toil, the optimism of its much-loathed Clippy office assistant would have seemed less demented, and thus less prime for ridicule. 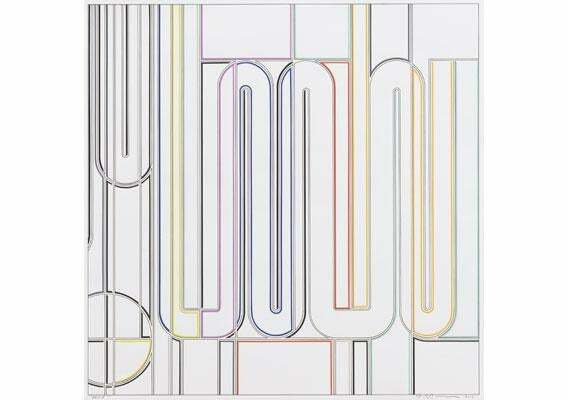 This unconscious association of the form of paper clips with the oppression of endlessness is at play in Sarah Morris’ Clip paintings. Skrepkus by Sarah Morris, 2010. But if the paper clip can be a symbol for endless drudgery, it can also be twisted, pulled apart, and used as a tool. And in this capacity, many of the practices to which it is best suited are the opposite of the commercially productive, sanitary, and morally meaningless act of clipping together papers. Paper clips can be used to pick locks, clean under fingernails, and hack into phones. Straightened out, they are used by office workers to distract themselves from the monotony of their intended use. Nearly every reader of Joshua Ferris’ novel of office life, Then We Came to the End, becomes part of his collective narrator as they read the sentence, “If a stray paper clip happened to be lying around we were likely to bend it out of shape,” and every white-collar underling must find familiar David Foster Wallace’s description of office life in The Pale King: “The way hard deskwork really goes is in jagged little fits and starts, brief intervals of concentration alternated with frequent trips to the men’s room, the drinking fountain, the vending machine, constant visits to the pencil sharpener, phone calls you suddenly feel are imperative to make, rapt intervals of seeing what kinds of shapes you can bend a paperclip into, &c.” The paper clip, which possesses inexpensiveness, interchangeability and consistency, has also been used as a symbol for the numerous: a Tennessee school collected 6 million paper clips to symbolize the Jews killed during the Holocaust, a project documented in a 2004 Miramax film. And its affordability can be a symbol of humble beginnings: In 2005, a Canadian named Kyle McDonald took a red paper clip and began a series of online trades that eventually netted him a house (not to mention a blog, a book, and a lot of public speaking gigs). A philosophical conceit called the “paperclip maximizer” is an artificial intelligence that, programmed by humans solely to manufacture as many paper clips as possible, eventually takes over the Earth and increasing portions of space in its quest for material, leaving trillions of paper clips with no one to use them. Finally, the simplicity of the paper clip has allowed it to become a graphic symbol on the digital desktop. For many a 21st-century office worker, it is more often encountered as the “attachment” icon in an email program than in the physical form of a bent steel wire. As we move further and further toward a paperless society, that loop-the-loop form might become more familiar in two dimensions than in three. But this semiotic doppelganger, like the clip’s colored plastic and novelty-shaped variants, is likely to accompany the original, not replace it. Office life, despite plane flights and email, just isn’t all that different than it was 100 years ago, and it’s likely to be largely similar in another 100 years. And the paper clip—which is just exactly good enough—is likely to be around to see it. Don’t forget to read about the design of the key, the book, and the other items featured in our series on the evolution of everyday objects.